Even owners of extremely large caravans can suffer from a shortage of space. Unfortunately, RVs simply just aren’t equipped with the square footage of a house. Before leaving home, try to ensure that you are only bringing the essentials. After you’ve packed, give it some time and then return and reexamine your luggage to see if there’s anything that could be left behind. This will ensure that you’re off to a good start. When it comes down to it, however, the ultimate trick to avoiding caravan messiness and clutter is simple organization and planning. While it sounds easy, caravan storage solutions can require a certain je-ne-sais-quoi in terms of innovation. If you’ve gone over your cargo numerous times now and are still feeling a bit claustrophobic, then don’t worry. To help you out, Caravan RV Camping has now collected the very best caravan storage tips into one practical storage solution guide. With a few handy pieces of advice from the following list, your caravan will be feeling more spacious than ever! Unless you’re planning to visit a popular nudist colony, getting dressed will likely be part of your traveling agenda. Unfortunately, you’re not going to be able to bring your whole wardrobe with you on the road. What you can do, however, is to invest in some basic rubber storage bins from one of your local $2 stores. These are a great solution for avoiding messy piles of clothes, stuffed in various bags and caravan corners, but can also be used for things such as kids’ toys and sandy beach cargo. If you can already envision where you’d like to place rubber bins inside your caravan, bring the area’s measurements with you when you purchase the tub to ensure an ultra-snug fit. Caravan campers often seem to forget that they are able to make use of their caravan’s wall and ceilings for storage space. Hanging items is a sure-fire way to gain some space by transforming an empty surface into well-organized storage area. Grab a few of the following items to ensure that your next trip is the roomiest possible. Hooks and hanging shoe racks are two of the most overlooked space-saving accessories when it comes to caravan camping. People often forget that walls and other various vertical surfaces provide the perfect space to store a variety of items. Hooks are particularly useful for storing kitchen utensils while the convenient pockets of certain hanging shoe rack models can be used to store anything from spices to toiletries. Often available in the form of strips, adhesive magnets are a great way to organize metal knickknacks. Like hooks and hanging shoe racks, these convenient stickers take an unused surface and transform it into an organized and convenient storage area. If you travel with children, these adhesive magnets are also particularly helpful. If placed at higher heights, they can easily be used to keep items like scissors and knives out of the hands of little ones. Brackets, on the other hand, are great for hanging heavier, more oddly-shaped items, like brooms and mops. Hanging wardrobes are a great way to instantly provide yourself with some added organization. Whether you use them for clothes or simple shelving is up to you! But at such an affordable price, and with a variety of styles available, they’re definitely worth the value. Install one from your caravan’s ceiling for the ultimate space-saving accessory. Collapsible, nesting, and dividing accessories are great ways to easily save space on the road. With the increasing popularity of caravan camping has come the increasing interest in creating functional, space-saving accessories. Kitchen accessories, in particular, showcase a wide variety of pop-up, collapsing and nesting capabilities. Folding dishracks, nesting pots, popup laundry tubs, and collapsible colanders are all great examples of great, space-saving accessories. In particular, nesting measuring cups and bowls are one of the best ways to make space in your cupboards. Spending a bit of cash to invest in accessories specially geared towards caravan camping is definitely worth it for the convenience and tidiness that they ultimately provide. A few popular brands to get you started include SmartSpace, Fagor, and Tefal. Some of the most innovative space-saving inventions we have seen have come from a great idea that turned into a do-it-yourself project. We’re not talking anything major here, but certain well-thought out customizations are often a cheap and affordable way to save some space. 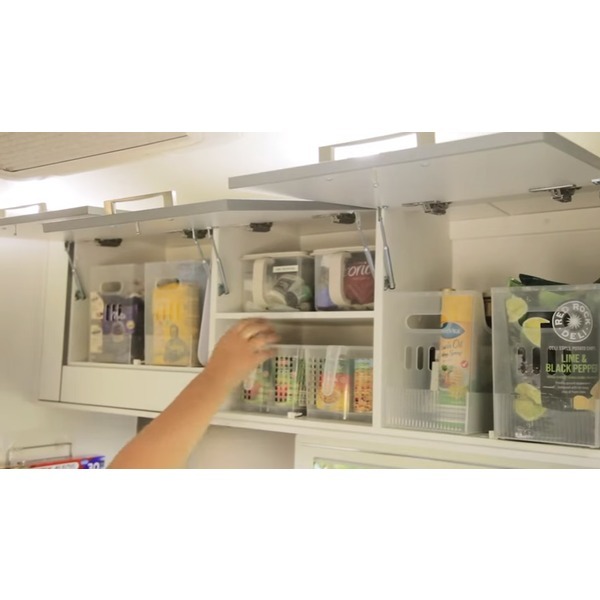 To make entire use of your cupboards without an annoying, restricting shelf, simply weld a bar alongside its front. Stack your dishes on a thin base the size of your caravan cupboard and then screw posts around them. Voila, instant dish stabilizer! Some campers have created a 2nd layer of flooring, leaving about 6 inches or so in between it and the first. By doing this, the inner layer can be used to store items. Hoses, in particular, can conveniently be stored here to protect them from stone damage. Installing a bar inside your cabinet is an easy way to organize entertainment items like magazines and movies. If you’ve made use of all of the previous tips and still find yourself lacking in available RV space, then it may be time to consider an exterior addition to your caravan. Rear-mounted caravan storage boxes are a quick and easy way to gain a bit of extra storage space, however, they can often sell for prices in the realm of $500 AUD. When taking its price into consideration, many people often wonder if the amount of space it can provide is worth it. If a caravan storage box is not for you, try considering a quality caravan annex. With a variety of high-quality makes and durable materials, annexes are a great way to boost your space on that large-scale that you’ve been looking for.